MEGA OFFER: Get Free SSL Certificate with all web hosting plans. Easyhost's SSD Web Hosting offers Top Notch speed and reliabilty (upto 6X Faster than HDD hosting), SSD Hosting Plans are for everyone who needs Rock Solid Speed & Uptime. We use array of Disk to replicate the data, real time. So your data is safe even if a disk crashes! We use trusted Third Party tool to scan uploaded data realtime - infected files are caught before they destroy your site. We use delivery expert tools to scan for spam and deliver your emails to Inbox - no IP blacklisting! Got questions regarding SSD Web Hosting? 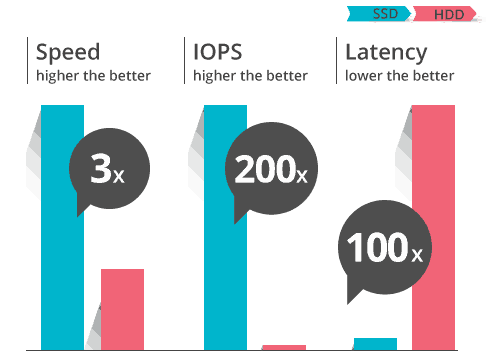 Who should choose SSD Hosting? Anyone can go for SSD Hosting, SSD works better than HDD for all kinds of website. If you don't have enough budget or you are beginner, you can go for regular web hosting plans. Does SSD hosting support Wordpress? Yes, SSD is recommended for Wordpress sites. We go one step ahead and take Off-site backups of accounts on a monthly basis (for applicable plans). This way your data is secured on another location and can be retrieved in case of a diasater. Copyright © 2016-2019 EasyHost. All Rights Reserved.